So turning back to jazz, this week’s artist was one of the best players of the walking bass ever to grace a jazz stage. Not that jazz was his only idiom. Before we get to that, however, let’s take a quick look at Leroy Vinnegar’s background. Feather & Gitler’s “Biographical Encyclopedia of Jazz” tells us he was born in Indianapolis, Indiana on July 13, 1928. He died of cardiac arrest in his adopted hometown, Portland, Oregon, on August 2, 1999. Writing on the allmusic.com web site, Richard S. Ginell states that Vinnegar turned pro when he was twenty years old and became the house bassist at Chicago’s Beehive Lounge, one of many music venues that were located on or near E. 55th Street. Vinnegar soon left Chicago for southern California where he had little trouble finding regular work. Vinnegar appeared with many of the biggest name in jazz, including Chet Baker, Shelly Manne, Andre Previn, Teddy Edwards, Stan Getz, Red Garland, Miles Davis and others. In the mid-1980’s Vinnegar moved to Portland, Oregon and became a stalwart of Portland’s jazz scene. In 1995, the Oregon State Legislature declared May 1 to be “Leroy Vinnegar Day.” In 1998, the Jazz Society of Oregon inducted him into their Hall of Fame, the first musician to be so honored. In 2002, the Leroy Vinnegar Jazz Institute was created by pianist and PSU professor Darrell Grant at Portland State University. All three musicians who appeared with Vinnegar on this disc are “locals” who are popular among Portland’s jazz fans. Mel Brown is himself at least as well known as Vinnegar was, from his early days as a session drummer for the legendary record label Motown. In the 1960’s and 1970’s, Brown recorded with some of the hottest artists of the day, including Stevie Wonder, Marvin Gaye, and The Temptations. Dan Faehnle is currently the guitarist for the group Pink Martini. He has also performed with Dave Frishberg, Rebecca Kilgore, Diana Krall, and many others. Sax player Gary Harris likewise has had quite a career, having appeared with Curtis Salgado, the Four Tops, Lou Rawls, to name only a few. With a crew like that, it would almost be impossible for this album to be a dud. Let me assure you right now that, of all the words that could possibly be used to describe this music, “dud” is nowhere in sight. “Integrity” opens with a song from Dizzy Gillespie and Frank Paparell, “Blue ‘N’ Boogie.” Everyone except Harris jumps in for the opening half minute, then that wonderfully deep tenor of his takes over and from there on they are off and running. When Harris steps back about three minutes in, Faehnle takes the lead and you’d swear he was going to melt those nylon strings. Vinnegar himself, usually content to stay in the background, takes over from Faehnle at about five and a half minutes in. The audience goes stone cold silent so as to not miss a lick, and less than a minute later you can hear one of the musicians exclaim “ahaha!” in a delighted voice as “The Walker” walks his way through a delightful exhibition of how the bass is supposed to be played. Soon everyone is back at it and tearing up the town. I have stated here on more than one occasion that I am not a big fan of recorded drum solos. I won’t belabor that point here, except to say that we are given a fine example of the exception that makes the rule when Brown takes his solo and shows us how it should be done. Two short solos punctuated by input from Faehnle and Harris, then two somewhat longer solos, neither long enough to become tedious. The Charlie Parker tune “Segment” is up next. As you might expect, this is a great bop piece that makes it awfully hard to not get up and move. As I write this I’m sitting here nodding my head from side to side, which actually is making it a bit difficult to type write this! Vinnegar’s bass drives them along, and the audience loves it. Freddie Hubbard’s “Little Sunflower” is next. This is a very quiet rendition of the song, with Vinnegar taking center stage for the first minute and a half or so before the others quietly join in. The pace picks up a bit, but mostly this is an exercise in quiet beauty, although later in the song (it runs almost fourteen and a half minutes) Harris, now on soprano sax, takes the volume up in a solo the audience responds well to. Before long we are back to mainly Vinnegar, with Faehnle adding just a few quiet notes, ironically playing the rhythm section role to Vinnegar’s bass solo. I’m going to skip ahead to a great Sonny Rollins tune, “Everywhere Calypso.” This is a great song, bright and lively in the way calypso’s are wont to be, and you can almost hear Rollins in Harris’ rendition. I have always loved calypso music, although I don’t believe I own more than two or three recordings of it. This is music that will pick you up if you’re feeling down, and raise you even higher if you’re not. Call me silly or simplistic or whatever, but I like that in a song. “Me Ho” from Hampton Hawes is an interesting song. The opening reminds me of the head to the tune “So What?” popularized by Miles Davis on his album “Kind Of Blue.” I make no pretense at having the skill or training to musically compare the two, but it seems pretty obvious that they have similar roots. The similarities end rather quickly, and once we get into the body of the song there is no comparison. Which is not to say I don’t like “Me Ho.” On the contrary, this is a great bop piece that I am pretty sure you are going to love. Harris is back on his tenor here and sounds fantastic. Faehnle and the others are magnificent as well. Great songs, great players, great experience. What more can I say? 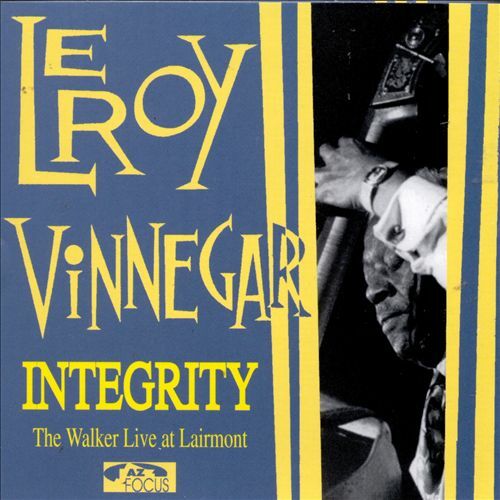 Simply that I am absolutely certain that you will find Leroy Vinnegar’s album “Integrity: The Walker Live At Lairmont” to be an outstanding addition to your personal playlist, for a Saturday or any other night. A web site called Jerry Jazz Musician has a fairly extensive interview with Vinnegar here. More information can be found by following the Darrel Grant and Leroy Vinnegar Jazz Institute links toward the beginning of this article.